When I first met him, he was a young man with only two speeds; flat out or sound asleep. He has known only hard work his entire life. He has been a drummer, a machinist, a medic and is now a Gerontologist. He can repair any thing that breaks, from a washing machine to a heart. He can accomplish more in one day than most people can in a week. He is the person who will always, always come to the aid of others. (Last year he was honored as a hero by the American Red Cross.) He is a wonderful story teller with a wild streak; a lover of jazz and art. He is also hot tempered, impatient, opinionated, and demanding, with very high expectations for himself and others. That is why I was so shocked the first time I saw him interacting with a person who has Alzheimer’s. I was so used to the impatient, quick, restless man. Who was this person of patience, quiet and calm? When he works with people who are living with Alzheimer’s, he slows everything down, his speech, his movements and his expectations. He sits quietly with people, waiting patiently for them to form their thoughts, never interrupting, never showing the slightest sign of being bored or restless. He is my husband and he is an Alzheimer’s whisperer. Tom and I began working with people who have Alzheimer’s about ten years ago. At that time, we had been married for many years, had raised our children, mourned the loss of our parents, and supported each other in our mutual return to graduate school. We had been through a lot together. I thought I knew him pretty well after all of these years together and all of the experiences we shared. I thought wrong. I was in for a complete shock when we began working together, building our memory support program. With his history and his personality, I was expecting Tom to experience a long and difficult learning curve working with people who have Alzheimer’s. Again, I was wrong. The term, “like a duck to water” might have been coined to describe Tom’s introduction to the world of Alzheimer’s. From the first moment, he was perfectly at home, perfectly at ease, perfectly happy working with, talking to and just being with people who are living with Alzheimer’s. There is a kind of magic that happens when Tom begins his work. I have watched him now for ten years and am still amazed by his ability to reach people living with Alzheimer’s. Our memory support program gives Tom (and everyone using it) many tools to interact successfully with people who have dementia. In Tom’s hands, these tools become a powerful device to reach people who may seem unreachable. When we walk into a long term care center, a memory enhancement center, an adult day facility, we often meet groups of people who are just sitting, staring into space, seemingly not aware of their surroundings or each other. Tom will sit down with this group and in ten minutes, they are talking and laughing, or singing, or playing drums together. I have seen this happen over and over and over for ten years, and every single time I am moved to tears to see the magic of the Alzheimer’s whisperer at work once again. Tom and Karen Brenner are Montessori Gerontologists, researchers, consultants, trainers and writers dedicated to working for culture change in the field of aging. 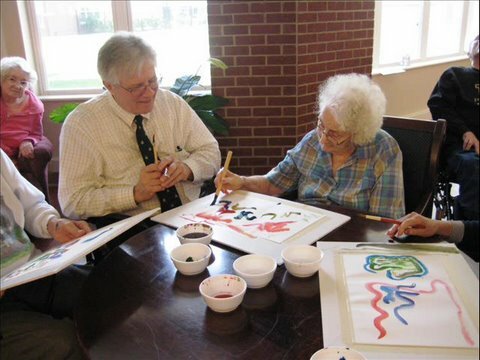 Tom is a gerontologist and has specialized in creating and researching dementia specific training programs. Karen Brenner is a Montessori educator and has specialized in working with children who are deaf or communication disordered. They have been published in magazines and journals both in the US and internationally. Learn more about Tom and Karen at Brenner Pathways.